Breathing Buildings are experts in the design of natural and hybrid ventilation. We have worked on hundreds of projects across the UK, are regarded as authorities on the subject by government institutes and we would love to help you designing the best, lowest energy ventilation scheme for your building. The Priority Schools Building Programme Facilities Output Specification (FOS) has changed the world of schools. The Education Funding Agency plans to update BB101 with guidance based on the standards in the current facilities output specification. 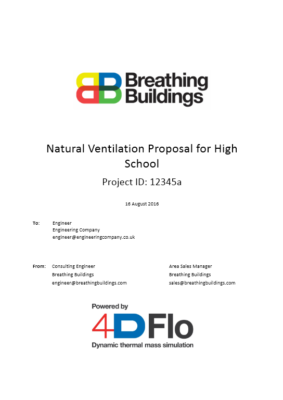 Having helped in the development of the output specification, we are uniquely placed to help contractors and engineers ensure that their school design project delivers a low energy solution with a superb indoor climate. FOS stipulates the use of the Design Summer Year (DSY) weather files, which makes it more challenging to avoid overheating than BB101 which accepted the use of the cooler Test Reference Year (TRY) weather files. Breathing Buildings dynamic thermal modelling software automatically generates output in terms of both air temperature and operative temperature. It is therefore really easy to assess designs against the new thermal comfort criteria. For naturally ventilated buildings, the maximum daily average CO2 levels are still 1,500ppm (the same as BB101), although the maximum acceptable value for a maximum of 20 consecutive minutes has been reduced to 2,000ppm. There is much more emphasis on the conditions in the space being comfortable and in particular the importance of mitigating cold draughts. There is now a requirement for pre-mixing of outdoor air, ruling out simple openings close to the occupant, which then leaves MVHR, NVHR® or e-stack®. MVHR is penalised by not only higher specific fan power but the requirement for more outside air to meet the new lower CO2 restrictions which results in higher energy consumption over the year compared with NVHR or e-stack®.